A big polynya just opened up north of the entrance to Nares st, the ice there is becoming more and more fragmented. Cross post, for a bit of nostalgia (see Neven's message ending link to an 'old' ASIB post). If Nares does not block up, what happens? Hard for me to imagine the Nares blocking up with GFS now calling for the next 5 days of significant winds occurring there. The GFS has been trending that way and it's only gotten stronger. I don't believe I've ever seen a traffic jam in Nares Strait once the arches broke. And I've looked for it, right after starting the ASIB (see here). Not much left now, as the remnants are dispersing. Here [is] ... a ... gif - the block smash in Nares strait. Now there is a steady 'river' of fragments flowing down the west side of the strait. Wind forecast 24 hours from now looks pretty dire on nullschool, it then proceeds to get worse. If this plays out it'll be the ultimate experiment in attempting to clog the Nares. To get an idea how much ice has left the Lincoln sea into Nares strait, I have tracked some floes back to the 12th when they were at the position they had when the ice arch broke. That's great Andreas, it really highlights how much is leaving. Not much sign that it's going to stop any time soon. At a very rough guesstimate of area, that is a triangle with sides of 140km. That works out to around 8500km^2. The last image in the sequence is 27th May, so that is 15 days of export. The Nares is open for the season. It will not clog up (if by this you mean ice not flowing south) until the next freeze season. I meant to do this earlier myself: the area marked with a thin yellow line on an overlay of 9th and 14th May measures 9670 km2 , so your number is a pretty close underestimate. Although the daily rate is probably correct to allow for another day or two to let the whole marked area pass into Nares strait. If I take the Lincoln sea as the area below a line from the northern tip of Ellesmere to the northern tip of Greenland, then that area is 4.8 times that. (43600km2) That means it would be cleared in about three more months of going at the same rate. Just to put this into context, lets see what happens. Just when you might have thought we reached peak shattering. The Lincoln Sea breakup continues in an ugly way. On the other hand, if it drifts west this chunk of fast ice is another chance to jam the entrance to Nares, making for interesting watching before it shatters. Though I find it more probable it drifts towards the Fram instead. I've been watching this ice separating in the Kane basin recently. That was big chunk which is no more. Now the remains of the ice are being hammered. See Worldview. That ice on NW Greenland was supposed to be some of the thickest sea ice in the Arctic. It's going to be down the Nares in a month or two and gone. The state of the ice in the CAA is pathetic, shattered like a high pressure vessel that exploded. The ice that usually has the most integrity in the Arctic is in fragments. According to PIOMAS animation from a month ago, it is indeed the thickest ice in the arctic, and a bad asset to lose. Warm water had most likely been working on that fast ice from below for quite some time now, and probably the whole area as far as that goes. Of course, none of the remnants left from last summer ever really got a chance to bond together properly over the winter. Plus, personally, I think all the thickness models need re-calibrated. P.S. CMEMS shows this area as currently having the thickest ice in the Arctic at 3.85 meters at the center; very much in harmony with PIOMAS. according to this paper linked by Terry in the Petermann thread strong winds in Nares strait help to bring saltier and warmer water to the surface. this would explain the melting which can be seen, particularly on the Greenland side where this upwelling is said to occur. Does the current also explain the way the ice is separating from the north of Greenland for a considerable distance? There seems to be a movement away from Fram and towards Nares, even across the far side of the northern headland on Greenland. There was a mention recently of a current becoming established in Nares, and then being self-sustaining. If that is the case then perhaps we will see a continuous clearing of the top of Greenland throughout the summer. Would dearly like to know what Andreas is thinking about this ATM. Looking at EOSDIS Worldview images of the Robeson Channel - Lincoln Sea portal for the past week, it appears that on-the-order-of 300 to 500 sq. km. of ice [area] is being exported each day (27 km wide x 15-25 km movement/day x 80% concentration). Once in Robeson Channel it speeds up and will ultimately (but not immediately) melt in southern waters. I'm sure this is small potatoes compared with Fram Strait, but this is all ~3 meter thick ice at this time, so export is on the order of 1 cubic kilometer per day (if my presumptions and calculations are right). The two months of 'early' Nares export (due to the Lincoln ice bridge breaking about 2 months early) may yield (roughly) 50 km3 of extra export. I now recall reading what you wrote, but didn't "use" your information when making my measurements and calculations - so it was, in fact, independent. NP. It's the way science works - independent confirmation of results. I respect this forum for its scientific and facts-based approach. Is there any history of this area being open... ever(in the satellite era, anyway)? Along the Greenland North coast, I mean. I'm not really sure what the implications of it is, so I'm curious if there's anything comparable that's happened. Ice is being hammered all around the Greenland coast. It's quite sobering to watch such rapid disintegration within a couple of days. The ice export around Greenland is quite sensational currently! I can't see anything like it this early in the melt season in previous years! The ice is so thin it is shattering and being sucked down the Nares. A 20 mile long block is just entering Nares. Thanks for the link to the paper on Nares upwelling salty warm water. I wrote about that being a likely culprit without having seen the paper. As a body surfer who has lived in California I am very aware of coastal upwelling associated with winds. The Lincoln sea and the coast of Greenland will be even more strongly affected by Eckman effects now that the ice is so mobile and the coast is clear of thick ice. The Nares must develop some very intense eddies - not a good place for your sailboat. As I wrote before I suspect that any ice entering the Nares is going to begin melting because of the upwelling of relatively salty water. It's impossible to track the fine fragments of ice using internet evidence so I can't prove I'm right but there's good reason to think that warm water is melting ice from below in the Nares strait. This upwelling warm water surely accounts for the Lincoln Sea polynya, too. (I.e., the answer to: Why do arches form in the Lincoln Sea and not at the top end of Robeson Channel?) The location of the sill is surely relevant to this. movement of ice has slowed down considerably. That it is still moving southward, although almost at a standstill from yesterday to today, must be due to water movement which is driven in part by differences in air pressure beween Baffin and Lincoln. I tried following a floe near the south end of Nares Strait back up to the north, but time gaps in coverage stopped me. A few floes did dance around in Kane Basin for a few days, though. 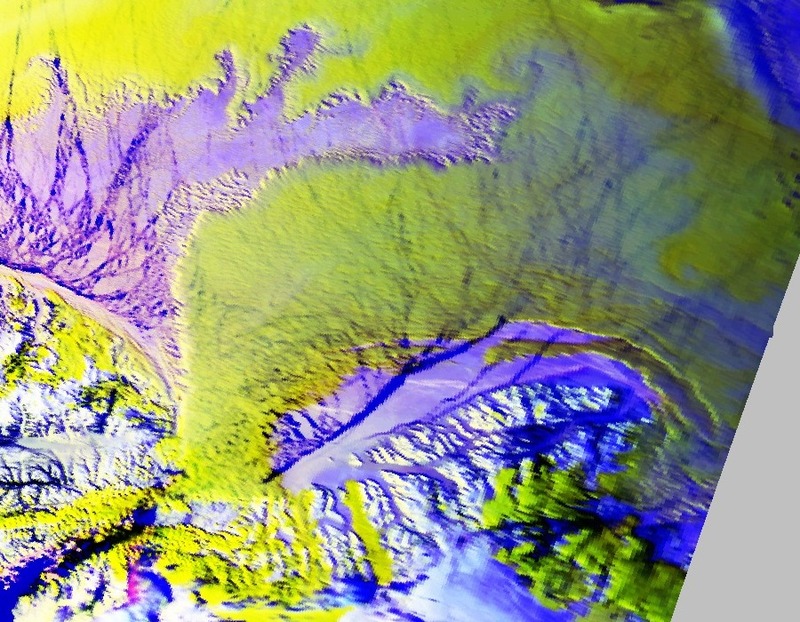 On DMI's June 4 TERRA image of the Kennedy Channel, the largest floe in the Strait was opposite Petermann Fjord. A smaller oval floe was near Joe Island. (Both outlined.) On the June 7 image, the oval floe appears to remain intact, but the larger floe disintegrated, probably on Joe Island, but possibly on Hans Island. The oval floe (presuming I have the same floe identified in the two images) went 120 km in 3 days. It is very sobering to see what is supposed the oldest and thickest sea ice in the Arctic crumbling away as it moves. A largish floe, from the (probably) thickest former-Greenland-fast-ice is just entering Robeson Channel (northern Nares Strait). As the winds, according to Windytv, will generally not be supportive of a quick trip down the Nares, will this floe get stuck on Joe or Hans Islands? The current, however, is swift: a floe that entered Robeson Channel on June 7 or 8 (clouds...) moved 45 km between June 9 and 10 (per EOSDIS Worldview). Screen shot from PolarView - June 11, 2017. GIF from Worldview. Here is a CBC english report regarding the cancellation of the science mission. Scientists measured the ice as being between 5 and 8 meters thick. A largish floe, from the (probably) thickest former-Greenland-fast-ice is just entering Robeson Channel (northern Nares Strait). As the winds, according to Windytv, will generally not be supportive of a quick trip down the Nares, will this floe get stuck on Joe or Hans Islands? The current, however, is swift: a floe that entered Robeson Channel on June 7 or 8 (clouds...) moved 45 km between June 9 and 10 (per EOSDIS Worldview). The largish floe has managed southward progress of about 12 km in 3 days (June 10-13). The slightly smaller square-ish floe that was beside it (on its NW side) on the 10th went 90 km in those same 3 days! This is evidence of the strong current along the Ellesmere Island coast. The weather station on Hans island shows an interesting pattern over the last few days, it seems the wind blows either up or down the strait, quickly flipping 180 deg into the opposite direction. Here is a CBC english report regarding the cancellation of the science mission. Scientists measured the ice as being between 3 and 8 meters thick. Thanks! Nice to see the two reports focus on different details of the story, they're not just bad translations of the same AP copy. 'Flipping 180 degrees'? Not quite - just going from 359 degrees to 1 degree - a 2 degree swing. A flaw of the graph display method, not a feature of the weather! So wind from (to?) between 240 degrees and 60 degrees. The high temps have caused the fast ice in fjords emptying into the strait, including Petermann, to turn a deep blue over the past couple of weeks. Tor, you should be able to see the different tinge here (I hope). Snow cover has melted as well.